^ Highlights of the 1991 Africa Prize. The Hunger Project. Retrieved 24 February 2009. 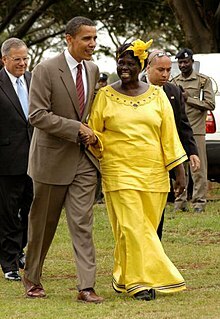 ^ 3.0 3.1 Wangari Maathai:'An alumna of whom we are most proud' 互联网档案馆的存檔，存档日期2007-02-05.. Retrieved 8 March 2010. ^ NAACP sets a date for image awards: Nominees to be announced in January; ceremony to be held following month 互联网档案馆的存檔，存档日期2009-01-09.. Retrieved 24 February 2009. ^ Mba, Ngozi (2009-01-22). Nominees for 40th NAACP Image Awards Unveiled. Jamati Online. Retrieved 24 February 2009. ^ Japan confers highest decoration on Professor Wangari Maathai. Nairobi, Republic of Kenya: Ministry of Foreign Affairs. [2009-05-24]. （原始内容存档于2010-05-18）. ^ Professor Wangari Maathai was awarded "Grand Cordon of the Order of the Rising Sun". Embassy of the Republic of Kenya in Japan. [2009-07-13]. （原始内容存档于2009-05-04）. ^ Nobel prize-winner tells seniors to be agents of change.